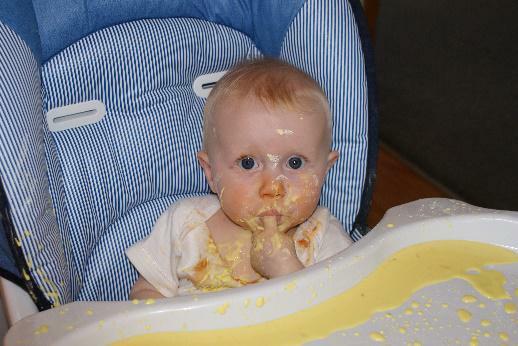 Getting messy is a great cognitive experience for your child and this activity is perfect for your baby. 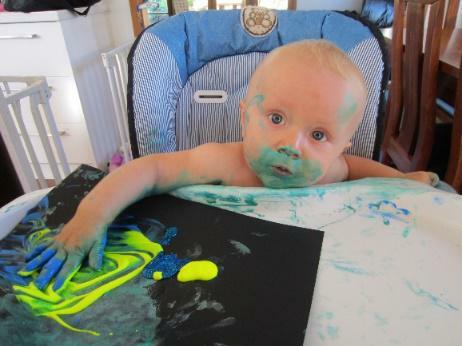 Using child safe paint is a fun way for your baby to have a tactile experience. 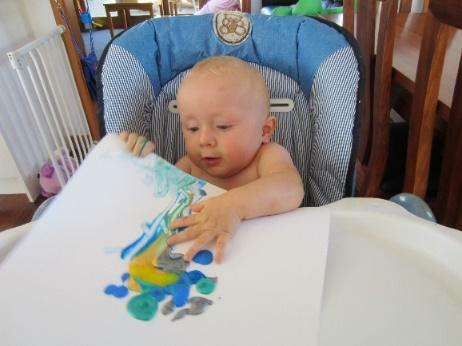 Any pictures created are a perfect gift idea for the grandparents. 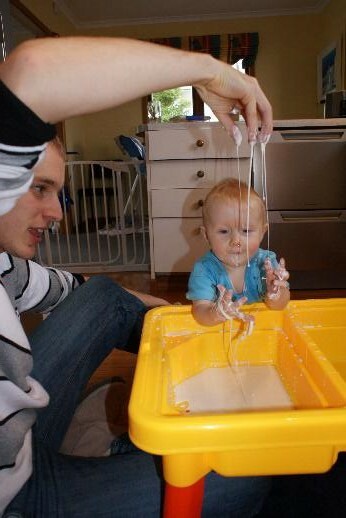 Is it solid or is it liquid? Can you pile it up to make a castle? 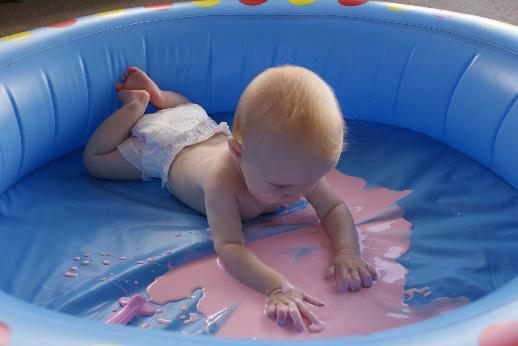 Can you write your name in it before the writing disappears? Divide the gloop in half and add different food colouring to each half. Watch what happens when the two mixtures meet! 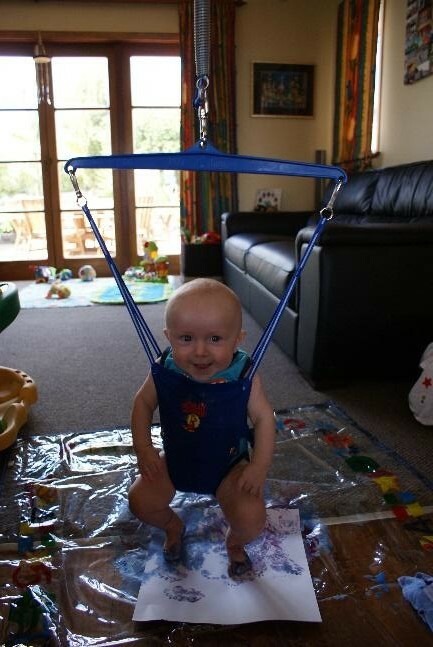 This is also a cheap and fun way to entertain children and the adult or adults will have fun too! This is one activity hubby always likes to get involved in and play with, sometimes I wonder who has more fun with it. It also makes your hands feel all soft. Pour the cornflour into a bowl, add the cold water slowly, stirring constantly and stop when the water is barely absorbed by the cornflour. CAUTION: Do not dispose of this mixture down the sink unless you are prepared to unblock the ‘u’ bend! Just throw it in the dustbin or feed to the birds (especially if you are outside). 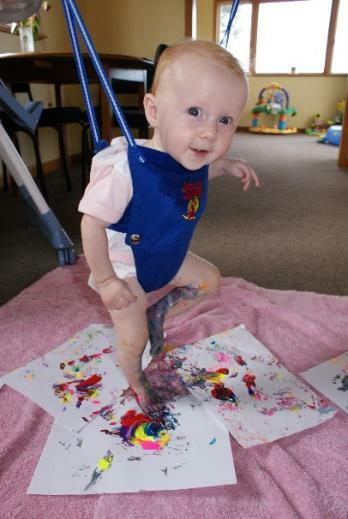 Painting in the Jolly Jumper is loads of fun too and you get lots of gorgeous pictures, little toes on the paper and lots of smiles. 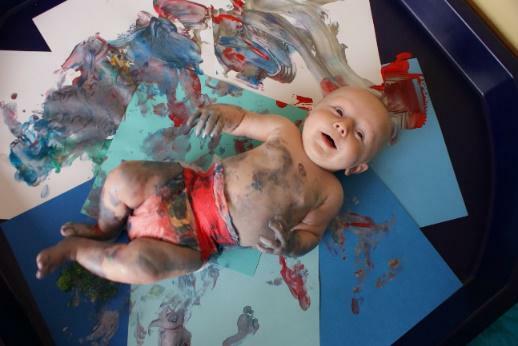 Just put a towel or sheet down some blobs of paint on some paper and then let them just jump. I liked using the scrapbook paper it covers more area and then was great for the kid’s scrapbook as title pages or as wrapping paper for presents (which the grandparents LOVE). 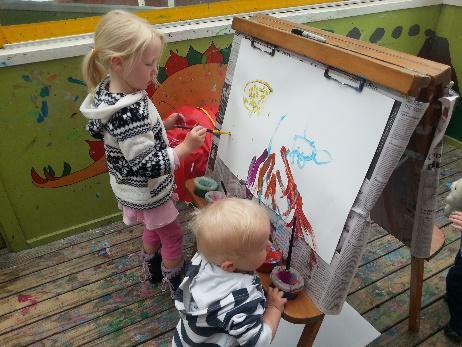 My Little Princess and My Little Prince painting in the Jolly Jumper. 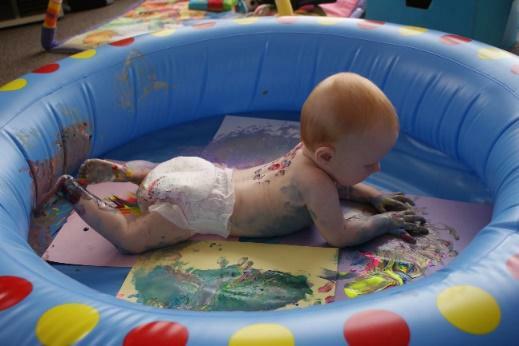 Painting in the paddling pool is loads of fun too and they love squishing the paint between their fingers. We would sometimes even take their nappy off just at the end and get some cute bum prints. Great inside or outside. Run a bath first so by the time you are finished you can chuck them straight in. 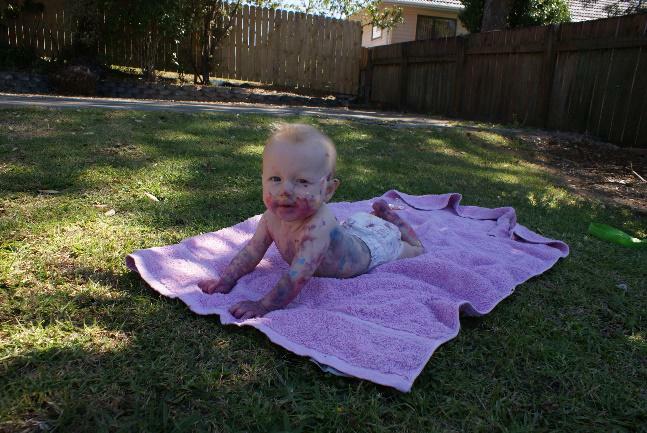 With summer here now this is a great one to do with your little one. 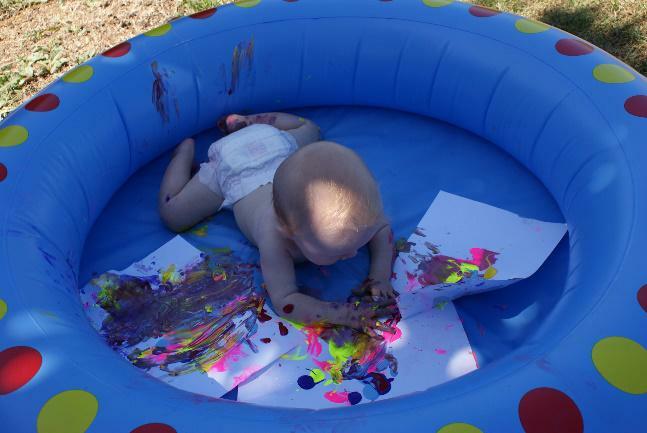 My little Miss and my little man painting in the paddling pool. Look at their faces they had such a great time! 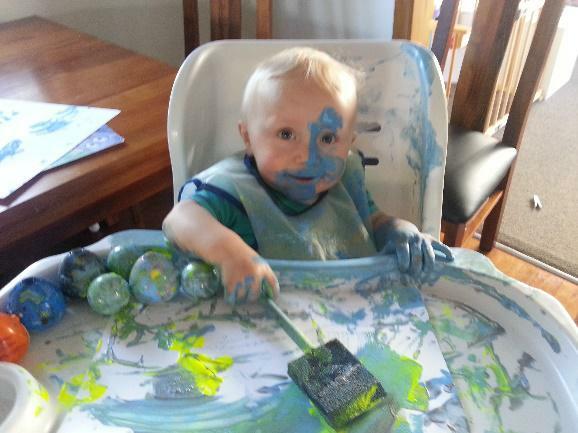 Highchair painting (or table top) is lots of fun too using paint and different brushes or tools gives bubs (or kids) the opportunity to explore and see different patterns. I go to the $2 shop (or cheap shop) to find different tools, such as combs, ping pong balls (safer than marbles), sponge brushes, rollers. Rolling pins, balloons (put a little water in to make easier to hold and not float everywhere only blow up to a small size – great in the bath once you got paint off), sponges, basically anything you can think of and never forget about fingers. 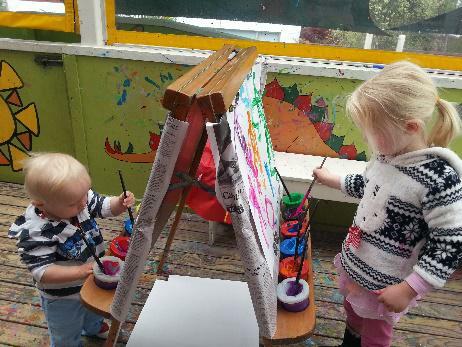 Easel painting is great too as it provides a different way to paint and look at things, it’s great because it can be social thing too like my two kiddies like to paint together sometimes on the same paper or on either side. You can also use other things other than paint for example – chalk, fly swats (new), sponges, and different brushes again anything you can think of. 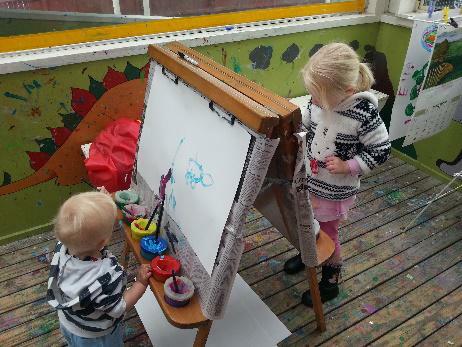 Food for thought- When doing easel painting put your child in painting clothes rather than using a apron most times paint still gets on the clothes and the apron can be restrictive and sometimes can put off children using the painting areas. I only use an apron when the kids are in the highchair and it will really get on them or it was a spare of the moment activity and they are in goodish clothes, but its sleeveless so doesn’t restrict the kids in any way. This blog was written by BubbeezMum, Kidspot Social member, for the Hasbro Month of Play promotion.